Butterfly gardening in containers will add some pizzazz and fun to your outdoor areas. It can become a hobby all on its own. 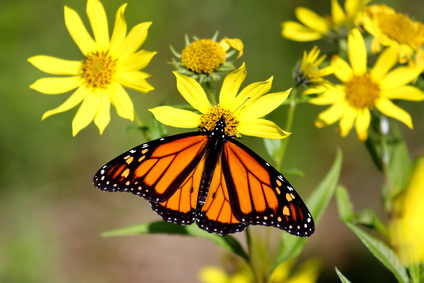 Choose the right selection of plants and turn your garden into a butterfly smorgasbord. It can be fun and sometimes mesmerizing to watch butterflies flit from one pot of flowers to another. The same design elements that make beautiful plant combinations for people to enjoy are the same ones to use when butterfly gardening in containers. Variety is the key. Having the same colors and types of plants in a container, while varying the heights, shades and time of bloom will create container gardens that attract butterflies all spring and summer. 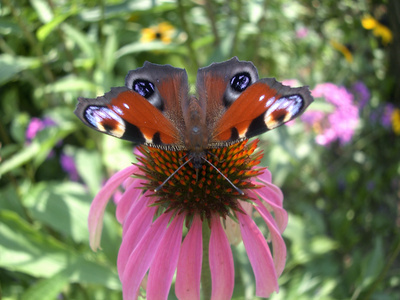 Purple coneflowers are butterfly favorites and they grow tall and upright. 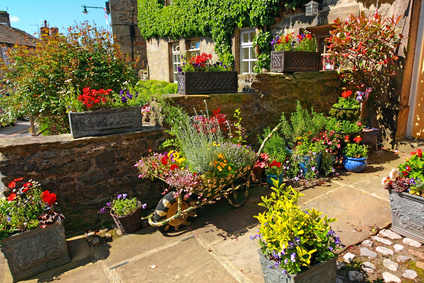 Plant trailing verbena or petunias around the base of its container or group it with pots of those types of plants to attract many different butterflies. Blooms for Butterflies – what do they prefer? Most people think the color of flower or shape of bloom is what draws butterflies. While this is partly true, the biggest attraction factor is the bloom’s nectar. Flowers rich in nectar are those with clusters of blooms like daisies. Examples would be mums, yarrow, coneflower (above) and butterfly weed. Bell-shaped flowers are also good. don’t want to have to fight the wind to stay on the plants. Butterflies need water too. If you have a water effect nearby, that is great. If not, you might want to set out a plant saucer with a little sand in the bottom and water enough to keep it moist. As you plan for butterfly gardening in containers, you may want to plant a few host plants for the caterpillars – milkweed, asters or mallow. Female butterflies lay their eggs on these plants because they are the only plants their new babies will feed on after hatching. 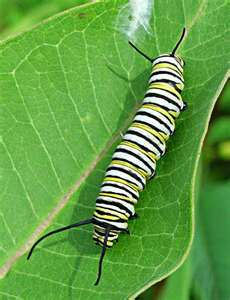 Dont forget to grow plants where caterpillars feed – they will soon become your butterflies! Each species of butterflies requires a different host plant. Find out which butterflies are native to you area, and then see which host plants those butterflies prefer. I can still remember in elementary school, going out to look for monarch butterfly (shown right) caterpillars. We kept them in a terrarium in our classroom and watched as they formed their chrystalis, and later hatched and became butterflies. Check out thebutterflysite.com to see kits and other materials that let your kids experience the miracle of butterflies firsthand. Here are some good plants to try as you begin butterfly gardening in containers. 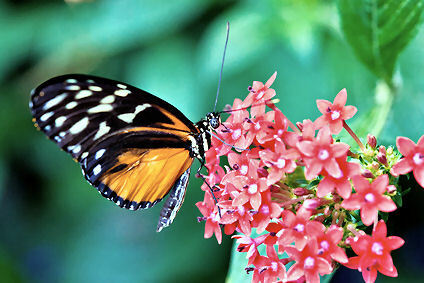 Butterfly gardening can easily become a hobby in itself. See which annuals and perennials are known to be butterfly favorites and will work well in container gardens. There are more than one species of the flower plants listed here. whole list of potential candidates for your butterfly container garden.